These are noble words, coming from a man who habitually swam naked in the Potomac River while he was president. Adams was more talented at writing and speaking than he was at politics. He published poetry, and learned the art of rhetoric. 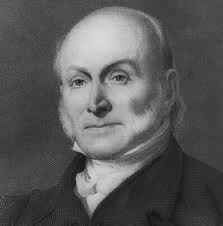 But his parents, Abigail and John Adams (the second US President), groomed him for public service, so at the age of 14, John Quincy became a diplomat. At diplomacy he was a genius, but when it came time to run for the presidency, he loathed the thought. By then, his mother agreed. She said, "I'd rather see him thrown as a log on the fire than to see him President of the United States." But he ran, and it was hell. All kinds of problems plagued him both in the running and in the implementing of his presidency. Andrew Jackson, who ran against him, became his nemesis because Jackson believed Adams had devised shenanigans to win the race. Jackson therefore stirred up Congress against Adams so that Adams never accomplished anything of significance during his term. It worked! After his term was over in 1829, Adams said, "The four most miserable years of my life were my four years in the presidency." It is NO WONDER John Quincy swam naked in the Potomac. The man had to let off steam somehow! But he redeemed himself by becoming the only politician to become a congressman after serving as president. It was here his joy and talent of speaking were recognized and he earned the title "Old Man Eloquent." He also accomplished much and earned great respect. Perhaps that is why he renounced skinny dipping later in life and swam the Potomac with his clothes ON--he no longer needed to let off steam. However, his explanation was that it was better to swim with clothes because you had to swim harder and that was good for the body. If you want more info, go to his Wiki Page, and see books about him at Amazon.